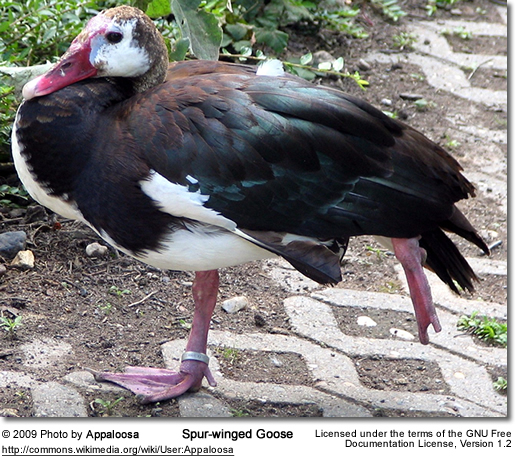 The Spur-winged Goose, (Plectropterus gambensis), is a large bird in the family Anatidae, related to the geese and the shelducks, but distinct from both of these in a number of anatomical features, and therefore treated in its own subfamily, the Plectropterinae. It occurs in wetlands throughout sub-Saharan Africa. Adults are 75-115 cm (30-45 in) long and weigh about 5.5 kg (12 lbs), with males much larger than the females. 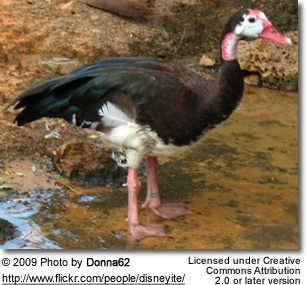 They are the largest African waterfowl amd are, on average, the world's largest "goose". These geese are mainly black, with a white face and large white wing patches. The long legs are flesh-colored. The nominate race P. g. gambensis has extensive white on the belly and flanks, but the subspecies P. g. niger, which occurs south of the Zambezi River, has only a small white belly patch. The male differs from the female, not only in size, but also in that it has a larger red facial patch extending back from the red bill, and a knob at the base of the upper beak. This is a quiet species, but may give a thin whistle in flight. The large nest is usually concealed in vegetation near water, but tree holes, other cavities, and old Hamerkop nests may be used. The spur on the bend of the wing may be used in disputes. 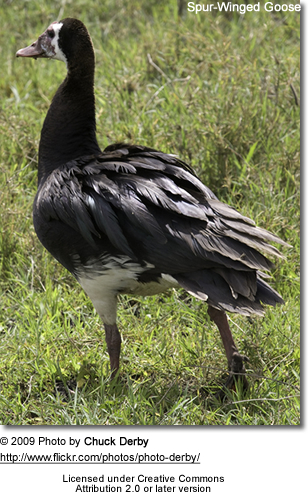 Spur-winged Geese feed by grazing and spends the middle part of the day resting by water.